It's the largest atom-smasher in the world, and after $150 million in upgrades, it's showing unbelievable energy output. A record amount of energy has been unleashed by the largest atom smasher on the planet, and scientists believe they may be unable to unravel some of the most elusive secrets in the universe with its help. 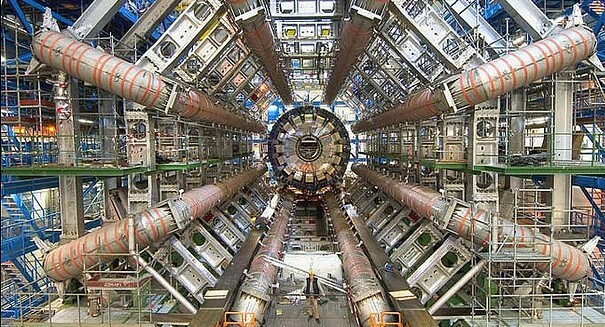 The Large Hadron Collider, a 17-mile tube that forms a loop underground in Switzerland and is operated by the European Organization for Nuclear Research (CERN), has been sidelined for two years to undergo $150 million in repairs and upgrades, and it has just now been awakened to begin uncovering the secrets of quantum physics, according to a Live Science report. Now, it’s showing an astonishing double the power that it had before the upgrades, with scientists in a recent test blasting protons at 13 tera-electronvolts in an amazing new test. As physicists work up to intensive experiments with the LHC, they are fine-tuning the system to make sure it’s ready, running some test collisions in order to set up collimators to protect the magnets and detectors in the LHC. The collimators shield the sensitive equipment of the LHC from wayward particles — since researchers must blast 1,000 billion protons around the ring at one time, some will venture off course and could float outside the main beam, striking and damaging the LHC’s equipment. The collimators, which are just blocks of metal basically, capture those stray protons. So far, the initial tests are looking good, and the 9,6000 magnets that throw the protons around the circle appear to work properly. Several experiments will begin in early June at 13 TeV to start producing data, as the LHC looks to build off of tremendous past successes when it discovered the Higgs boson — aka, the “God particle” — in 2012 after years of searching and theorizing. The Higgs boson is believed to explain how particles get their mass. These higher energies could allow the LHC to go even farther: to find heavier particles that haven’t yet been discovered, or additional dimensions, or even twins of the Higgs boson. Or it could shed light on the hypothesis of supersymmetry, or the theory that subatomic particles have superpartners.